Renee' MacMurray, was raised in Hingham Massachusetts. activities, influenced by her mother who was also an artist. at Massachusetts College of Art in Boston. and Mother she decided to go to college to become a professional "Artist". a minor in Fine Art and Children's Book Illustration. as well as developing their Advertising Department. which she then changed to "MACMURRAY DESIGNS" in 2008.
branching into the decorative painting industry. Renee' was asked to paint her first Mural. custom hand painted murals for residential and commercial properties. 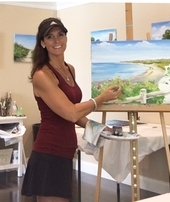 Custom House Portraits and Painted Murals. South Shore Living, Cape Cod Home & Islands, Home & Garden and Boston Magazine. Currently, Renee' is slowly shifting from Mural Artist to Art Teacher. Hingham/Weymouth/ Rockland line in Ma. mind, body and soul through creativity and relaxation. Aromatherapy, Hypnosis and Message Therapy. of people with parkinson and other physical challenges. and busy world we live in today. for her to give back to the community and offer a place a peace and serenity. who was also an Artist and always encourage and supported Renee' in every step of her life.